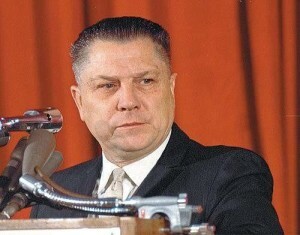 Has Jimmy Hoffa Been Found? Jimmy Hoffa–once a powerful union leader before his imprisonment in 1967 has been missing since 1975, and since then law enforcement have been working endlessly to try and unearth his body,with tips coming in from all over the world. It seems every few years a new tipster will make claims as to where Hoffa’s body was buried, and officials have investigated them all, digging up bloody floorboards and excavating old barns to no avail. A new tip has come in from a Detroit suburb, and police are calling the him a “credible” tipster. The person claims that Jimmy Hoffa is buried beneath a home, and investigators say they will take soil samples to test for human remains. A radar device has confirmed that something is buried down there; they just can’t tell what it is. “It could be anybody down there, could be nobody. It could be a dog,” said Roseville, Michigan Police Chief James Berlin. In other words, no one wants to get their hopes up. If an excavation is given the green light, it could take days to find anything, and even if what they find turn out to be human remains, they might not necessarily be those of Jimmy Hoffa. The tipster hasn’t claimed that the body belongs to the missing man, but says a body was buried beneath that house around the time that Hoffa disappeared.